Reilly’s Antiques (Prosperous) Ltd as a family business appreciate your privacy is important and we are committed to protecting your personal data and right to privacy. We will always keep your personal data safe and comply with the General Data Protection Regulation. We ask for your data in order to fulfil a service to you, to process a sale or a purchase, to complete a valuation/ answer an inquiry and we also may contact you regarding our sales / services if you consent. By law, you have a number of rights when it comes to your personal data.We engage with clients who purchase from us outside the EU however we comply with EU GDPR policy for all our customers and prospective customers. If you want to exercise any of these rights, please contact us using the details at the end of this notice. If you are on our mailing list / SMS List we will periodically send promotional emails/ texts about new products, special offers or other information which we think you may find interesting using the email address or mobile number which you have consented to and provided. You can opt out or unsubscribe at any time , you can also update your email details on our website. Your information is held by us for as long as you consent to receiving marketing information. We collect some customer tracking data and we may use the information to improve our products and services. For an enquiry we will process your name and contact information. If you purchase from us in order to process your order, we will need to process your data in order to send /give you the goods that you have purchased or to get the goods delivered to you. We need to process payment details in order to fulfil the contract. We will retain your personal data for 7 years for revenue and legal requirements. We use third party business support software for our auctions. When you register as a bidder for our auction we hold this information for at least 3 years and if you purchase at our auction the information is maintained for 7 years to comply with Revenue and Legislation. Our Auctions are not recorded. CCTV is in operation in and outside our premises and is for security reasons. CCTV records are kept for up to 50 days. We use third party business support services for marketing, accounting, administration and to process payments. Below is a list. Mailchimp, Facebook, Sendmode, Auction Technology Group, Sage, Payment Sense, AIB. At your request we will provide details to trades people. We do not share your personal information to third parties unless we have your permission or are required by law to do so. We are committed to ensuring that your information is secure. In order to prevent unauthorised access or disclosure, we have put in place suitable physical, electronic and managerial procedures to safeguard and secure the information we collect. All our computers are password protected, as are our phones and tablets. Financial and payment services regularly employ security updates. We use website cookies but only to assess customer traffic which is non-unique data. 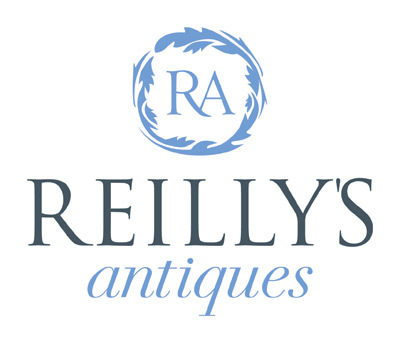 You may choose to restrict the collection or use of your personal information or change your mind regarding marketing by writing to or emailing us at info@reillysantiques.ie. If you believe that any information we are holding on you is incorrect or incomplete, please write to or email us as soon as possible. We will promptly correct any information found to be incorrect.